Since Ethernet offers faster transfer rates and better security than Wi-Fi, more people have been implementing Ethernet networks into their homes. But, inevitably there are things that are more exciting to spend money on than others. Buying a new TV, computer, or monitor is almost like buying yourself an early birthday present. Buying new network components is more like fixing potholes; it’s necessary and makes for a smoother ride, but it’s not exactly exciting. So when you finally decide to upgrade to a gigabit network and don’t get gigabit speeds, you might be very understandably frustrated. Well, let’s take a look at some networking basics to see what is going on. Gigabyte (GB) hard drives have been around for years. A gigabyte is about 1,000 megabytes(1024 to be exact). If you assume that transfer speeds of 1 Gbps (gigabit per second) means you get speeds of 1,000 megabytes per second, you’re not alone. Unfortunately, you’ll also be disappointed. The difference is in the terms gigabyte and gigabit. There are 8 bits in a byte so, in reality, 1 Gbps translates into about 125 megabytes per second (MBps). Remember though, that is just the theoretical limit of a Gigabit network. In reality there is always a bit of overhead on a network because of all the different components that have to work together. If you are getting anywhere around 80-100 MBps, your network is doing pretty good. Let’s take a look at what goes into a network so we can see where any potential bottlenecks might be. In order to get gigabit speeds on a network, every component must be capable of gigabit speeds. A network always runs at the speed of the lowest common denominator. What does that mean? Well, think of it this way: if you were driving on a small two lane highway and got stuck behind someone driving an old, beat up truck going 45 mph, it wouldn’t matter how fast or sporty your car was, you’d be stuck going 45 mph until you could pass. Well a network doesn’t have the luxury of passing; it will only run as fast as the slowest component. So what makes up a network? Well, there are three basic components that are vital for any Ethernet network: the network controller, network cable, and the hub/switch/router. The first thing to check is the network controller card. This is pretty easy since many computers come standard with gigabit Ethernet connections. If your computer (or other device) doesn’t have one, you have one of two options. You could get a PCIe network card, which goes into the PCIe slots on your motherboard. 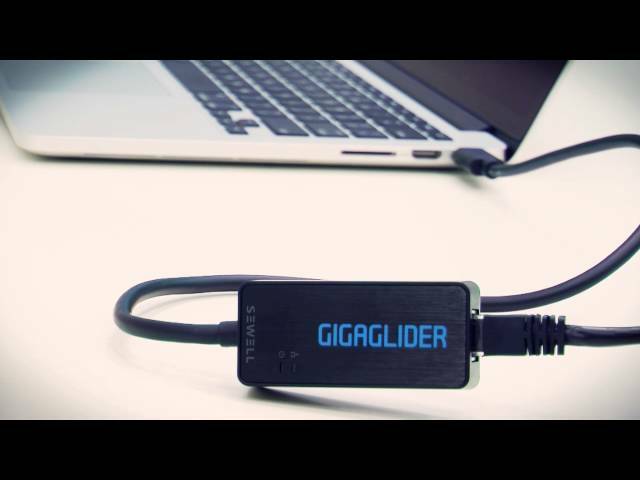 If you’re not super tech-savvy or you don’t have a desktop computer, you can get USB to Ethernet adapters, like the Gigaglider, which offer gigabit speed network connections from your USB port. Just remember, for that to work you need to have USB 3.0, otherwise you’ll get lower connection speeds. The second step is getting network cable that is gigabit compatible. Luckily the most common network cables (Cat 5e and Cat 6) are both gigabit compatible. However, make sure that the cable you are using is good quality. Low quality cable will have an effect on network speeds, even if it’s technically rated for gigabit speeds. At Sewell Direct we test all of our network cables extensively to make sure you get the best quality cable available. The most expensive component in a gigabit network is a gigabit capable hub, switch, or router. While you can get a hub, they share all of the bandwidth at each port, which lowers network speeds. A gigabit switch directs network packets to the proper ports, which is much more efficient, and therefore much faster. A router is like a switch, but it also connects your network to the internet. 10/100 Mb routers and switches are much cheaper than 10/100/1000 Mb (gigabit capable) ones, but they can only achieve 100 Mbps transfer rates. Making sure each of these three components will give you a gigabit network, but that doesn’t guarantee gigabit speeds either. In our ongoing transportation analogy, a gigabit network upgrades your two lane highway to a modern freeway, but if your car can’t go the speed limit, you’re still not going to get there any faster. The car here is your computer, and there are tons of different factors that can affect your computer’s performance. The biggest bottleneck when transferring large files over the network is the read/write speed of your hard drive. However, your system, memory, and how many programs you are running will also affect network speed. While it’s almost impossible to achieve a full 125 MBps transfer rate on any network, if you have a reasonably new computer, and all of your network components are gigabit capable, you should be able to achieve very fast network speeds. SolidRun Cat6 Cable, UTP, CM, Light Gray PVC jacket, 1000 ft.